Fans and non-fans have to admire at least one thing about U2: The fact that they have stuck together for 30 years. It’s not easy. When creative minds collaborate it can be, much like your 7th grade chemistry experiments, either beautifully wonderful or dangerously volatile. I think of Uncle Tupelo’s split, the Chili Peppers’ split and reunion, Peter Gabriel leaving Genesis, Pink Floyd, even David Lee Roth. As I mentioned in the previous post, George Harrison struggled with his role in the Beatles. He was a musical genius, not just for being a great guitar player, but his songwriting was top notch. George Martin, longtime producer of The Beatles even stated that he overlooked much of Harrison’s songs. The Beatles albums featured a Harrison written song here and there. John Lennon even said to McCartney “George’s songs are at least as good as ours.” When Frank Sinatra performed “Something” (written by Harrison), he even said mistakenly called it his favorite Lennon-McCartney song. When he released All Things Must Pass very soon after the break-up, it was clear that he had built quite a large catalog of material. Later, Harrison admitted that many of the songs on the triple album would have been Beatles songs, but he had trouble getting everyone on board to record them. 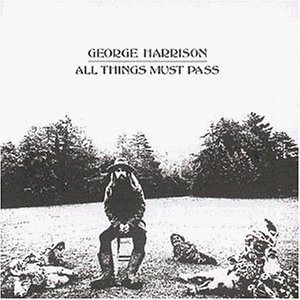 All Things Must Pass was the first triple album from a solo artist. George called in the help of friends to make it. Eric Clapton played on the record but went uncredited for over 30 years because of contractual committments. Bob Dylan collaborated on writing the opening track. A 19-year old Phil Collins played drums on a couple tracks. Peter Frampton, Ringo Starr, Billy Preston, Dave Mason, Ginger Baker and members of Badfinger all contributed to the album. Considered one of the greatest albums of all time, the cover featured George and garden gnomes dressed similarly. In 2001, George Harrison oversaw the remastering of the album. As they remastered the album, the original master tapes were erased intentionally. Sadly, George Harrison, singer, songwriter, guitarist, activist, film producer, and Wilbury, lost his battle with cancer in 2001. He was inducted into the Rock and Roll Hall of Fame as a solo artist in 2004. In 2002, a year after his death, a charity concert was put together in his honor. The concert featured his son Dhani filling in for George with the remaining members of the Wilburys. The concert ended with an ensemble dubbed “George’s Band” included McCartney, Starr, Clapton, Tom Petty, Jeff Lynne, Dhani, and others performing “While My Guitar Gently Weeps” and other Harrison classics.